Redditch is home to something extraordinary. Not the Forge Mill Needle Museum or the Royal Enfield motorbike. Something big, and absurd, and noticed by almost nobody. Redditch has a cloverleaf interchange. There's nothing inherently absurd about a cloverleaf interchange, you understand. Around the world, they are the simplest and most common type of junction where two motorway-type roads meet. The first ones were built in the 1920s and they're still built today. They're just not built in the UK. Not only is the cloverleaf not ubiquitous here, as it is in virtually every other nation with a well-developed road network, it's unheard-of. Only three have ever been built in Great Britain, and none in Northern Ireland. Of those only two survive today. Two of the three were relatively small and lived right next to each other on the A899 in the New Town of Livingston, just west of Edinburgh. One was replaced in recent years with a more ordinary junction, but the other, Cousland Interchange, survives. The third cloverleaf is much bigger and it's in Redditch, another New Town, this time in Worcestershire. It connects the Alvechurch, Alcester, Bromsgrove and Warwick Highways together and it's rather brilliant at what it does, though it's also an undeniably eccentric choice of junction in a country where most drivers have never seen a cloverleaf before. You'll find it in the equally eccentrically-named suburb of Headless Cross. It was completed in the late 1970s. Indeed, so lonely is the Redditch cloverleaf - so completely alone in a cloverleaf-free nation - that the next closest cloverleaf interchange is at Oostkamp, the junction of the E40 and E403 just south of Bruges in Belgium, 234 miles away. The other UK cloverleaf at Livingston is 257 miles away. No matter. The cloverleaf at Redditch is, by any measure, magnificent. It's big, for starters, and its sliproads have two generous lanes throughout - just in case you want to overtake someone on a 270-degree loop. It has landscaping not just in the loops but also between the loops and the outer left-turn sliproads, so once you're on a sliproad you lose sight of everything else and you just travel for a while on a curving helter-skelter through what appears to be a manicured garden. And it lets you do something you can do almost nowhere else in the UK: you can travel around the four loops for as long as you want, uninterrupted. If you did it literally forever then it would look a lot like this looped video clip. Your browser does not support this video content. What you will learn, if you decide to spin around the four loops for long enough, is that they're big enough to allow a steady speed of 38mph to be quite comfortable all the way around. Those loops are big. The story of the cloverleaf in the UK is a story of repeatedly designing roads with cloverleaf interchanges and then, at the last minute, deciding that something else would be better. In the 1930s and 40s, before we had any motorways and when the German Autobahn network was the best template for what a future British motorway might look like, engineers expected that we'd be bristling with cloverleaf junctions in no time. The 1943 plans for the Preston Bypass, the road that fifteen years later would be the UK's first motorway, called for two cloverleafs along its eight-mile length. In the 1950s, as planning for the motorway boom of the following decade got under way, the Anderson Committee's designs for lovely blue motorway signs included a one set that were specifically for use at cloverleaf interchanges - a situation that has never been required but was thought to be an absolute certainty back then. And this 1961 road atlas, wanting to advertise its up-to-date maps showing all the thrilling new motorways, put a cloverleaf (of sorts) on its front cover. In the early 1960s, designs were drafted for Almondsbury Interchange, the junction of the M4 and M5, and the first place in the UK where two motorways would cross and a four-way interchange was needed. The Ministry of Transport ruled out a three-level stacked roundabout (thank heavens) and instead proposed a cloverleaf. It was only when the job was handed to a firm of consulting engineers, Freeman Fox and Partners, that the volume of turning traffic caused a re-think and the UK's first four level stack was built instead. Lots of motorway-to-motorway junctions now exist, but none are cloverleafs. Every time, it seems, it was decided that something else would be better: a higher capacity junction without weaving between the loops, or something smaller that used less space. The cloverleaf was always the bridesmaid and never the bride. Perhaps it's no surprise, then, that the only place a cloverleaf has ever been built is in a New Town - the 1960s home of bold experimentation and new ideas. Where else would something completely new and unfamiliar be willingly tried out? Where else would there be boundless expanses of land to lay out spacious highway interchanges from scratch? Where else, indeed, could a highway engineer who had always wanted to build a cloverleaf quietly sketch one into the plans without anyone really minding? No wonder that Livingston got two. And no wonder that Redditch - with its often-overlooked but surprisingly extensive expressway network - got one as well. Today, virtually hidden from view by its trees and shrubs, the cloverleaf quietly gets on with doing its job. It feels, most of the time, eerily quiet - but traffic counts reveal that tens of thousands of vehicles swoop around its sliproads every day, with extraordinary volumes of traffic turning between the north and west arms of the junction - up to 15,000 vehicles a day. It only seems quiet because it handles the traffic with great efficiency and causes no delays. It's so efficient, in fact, that the occasional road tourist doing multiple laps of the four loops to record a silly video for a blog post will cause no inconvenience whatsoever. The irony is that the New Town road network of Redditch is better known for its roundabouts, and is home to the Roundabout Appreciation Society of the UK. Perhaps it's time to form a rival organisation, the Cloverleaf Appreciation Society of the UK, to champion the feature of the Redditch highway network that truly is remarkable. Livingston was actually meant to have a third cloverleaf at where Lizzie Bryce Roundabout is. One of the outer slips was even built on the north-west quadrant, before they canned it for the roundabout. It's still there, but I suspect it's only because there might be pipes running underneath it, and the fact it doesn't really need to be removed. Cloverleafs are all over Germany, I did notice a refinement in that the loops on one I saw connected separately from the main carriageways with entry exit ramps.A speed limit was applied on the off-line part and certainly made me feel a bit more secure when traversing the links. This goes a long way to alleviate the situation of slowing traffic leaving, clashing with traffic entering and speeding up. This was always the defect in cloverleafs. Of course for well over 30 years, "free flow" has been two four letter words in the UK when it comes to roads. Is the plural of cloverleaf "cloverleafs" or "cloverleaves"? The junction of the A386 and B3413 (old A38) in Plymouth is effectively a cloverleaf with the pairs of adjacent sliproads merged into two-way roads – which are all named streets and one of which has shops along it! Well almost a cloverleaf, if you ignore that roundabout in the NW quadrant. The strangest cloverleaf I've ever seen is the M6/M9 interchange in Hungary. The M6 is part of the north-south route between Budapest and the port of Ploče in Croatia, and the long-term plan for the M9 is for it to be a huge cross-country bypass, but at the moment they're effectively just local bypasses for a few small cities. The M9 is single-carriageway (with overtaking permitted! ), except through this junction, where westbound traffic is diverted onto the course of the as-yet-unbuilt second carriageway, and has to swerve sharply at both ends of the dual carriageway section. A sensible bit of future-proofing for sure, but it looks very odd on the ground. Also, the whole junction is about the size of the M3/M25 interchange in Britain, i.e. absolutely enormous for the traffic levels involved. 1943 designs for Preston Bypass: MT 117/21. Almondsbury interchange initially designed as a cloverleaf: MT 95/523. 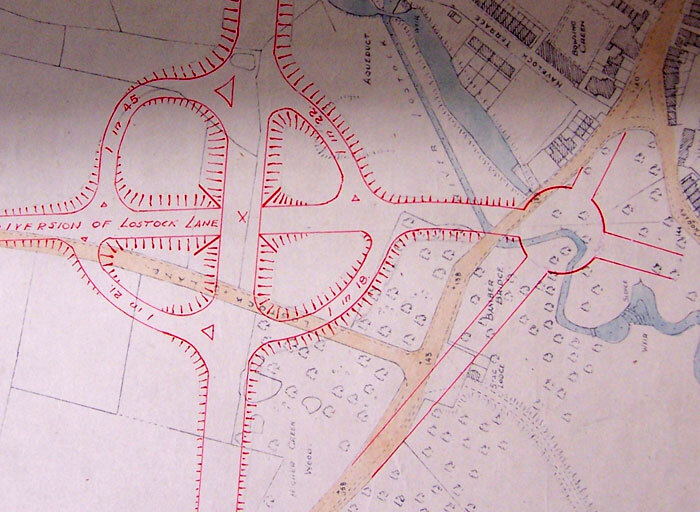 Diagram of cloverleaf interchange at Bamber Bridge extracted from MT 117/21.